With a diverse and successful real estate background, Brandon Turner offers clients a 360-degree perspective on the market and the ability to advise on a number of project types and goals. Brandon began his real estate career in Florida where he worked on commercial and residential deals, retail leasing and various land sales. He also has experience in real estate marketing, managing investment properties and working closely with bank owned properties. He is a master at positioning properties through impeccable visuals and targeted digital outreach. This thorough skill set is reflected in Brandon's work today. 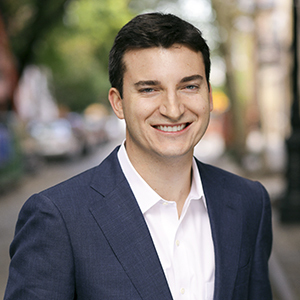 As a member of the Dawson New York Team at Compass, he assists buyers and sellers with all types of properties, at all price points, in a wide swath of neighborhoods throughout Manhattan and Brooklyn. Above all, Brandon believes in delivering an elite level of client service. His clients are always his top priority, and he prides himself on being available to them 24/7. Always honest and straightforward, clients who become close friends are his greatest reward. Originally from Westchester, New York, Brandon resides in the vibrant Flatiron District. When he's not hard at work, he enjoys spending time with friends, playing basketball, golf and volunteering.